In this article, Kushagra Gour introduces Web Maker, a browser extension he created for front-end developers who want a blazing-fast, offline web playground. If you’re a front-end developer like me, you’ve probably tried one or more of the code playgrounds out there like CodePen, JSBin, JSFiddle etc. They’re all great and do the job perfectly. I’ve mostly used them to figure out issues I’m facing, or to discuss code snippets with colleagues. But I’ve always felt a slight friction in them having to work over the internet — with an inherent delay between starting them up and being able to use them. I also wanted a quick way to hack stuff while traveling or waiting at the airport, where you’re mostly offline. Of course, you can use an editor and see the results in the browser — but in this fast-paced world, that’s slow to set up! So I decided to make something myself, and created Web Maker. Now I use it to do all my web experiments — and even to develop Web Maker itself! You also have the option to save and load your creations for later editing. They’re saved in your browser’s localStorage. We get asked fairly often about an offline version of CodePen. While we think that would be cool, in all honesty, we aren’t particularly close to that. If you’re looking for a CodePen-like offline editor, and use Chrome, check out Web Maker by Kushagra Gour. In addition to having multiple editor layout options, each of your saved creations remembers the layout it last used, along with the code pane sizes. So, basically, whenever you load back any creation, you get the exact same editor configuration that you last saved the creation in. Also, you get a full screen layout to see your work in actual browser window size. Chrome extension APIs give Web Maker immense power to do stuff that normal web apps can’t. One example is screenshot capture. Just click the Take Screenshot button anytime to take an instant screenshot of your preview. Or say you want to share your creation with the world: the Open on CodePen button opens your creation inside CodePen. I have made Web Maker open source on GitHub. I think it connects me more with the users, who can suggest features they want or log issues they face, all in one place. There are many interesting logic pieces that go into making such a web playground. All those are open to see and learn from. I personally loved working on prevention of infinite loops using Esprima. There are many interesting ways Web Maker can be used apart from the usual web development stuff. Let’s look at some of them. If you’re starting to learn web development, Web Maker is a good place to do your daily practice, assignments etc. You can focus on just writing code without getting into setting up an editor or a build process for using preprocessors. You can develop and try out such independent components quickly in Web Maker — and integrate them into your app when you’re happy with them. Since Web Maker works offline, it’s a great platform that can be given to students in a classroom to explore things while they learn. When you’re trying to find the cause for an issue in your app, it’s worth isolating the suspected component so that you can debug in a much smaller environment without any interference from rest of the app. 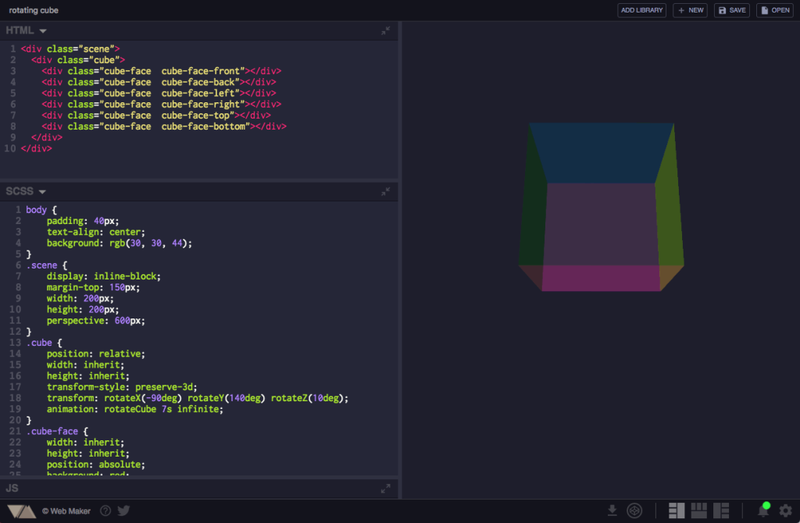 Web Maker’s a great tool for quickly running a piece of code like this. Found some interesting code snippet on a website? You don’t have to remember or note down the URL. Simply fire up Web Maker, paste in the code snippet, give it a title and save. You can open these later for reference or editing. Import/Export. Soon there’ll be an option to export all your creations and they’ll be importable back into Web Maker. You’ll also be able to create backups to the cloud, to services like Google Drive. Editor customization. More customization settings are on their way, including the ability to set font sizes, themes and indentation. There’s more information on the roadmap on the GitHub issues page. So, that’s an introduction to Web Maker, a browser extension I created to make life easier for front-end developers. Because Web Maker is open-source software, you have the opportunity to mold it into something you want. You can request features, or even contribute code to get those interesting features into Web Maker. You can also follow @webmakerApp for future updates, to suggest a feature or just to say hi if you like it! If you’ve tried Web Maker and have any questions or feedback, please post a comment below. Kushagra Gour is a front-end developer from India working at a startup called Wingify. He likes making games and solving problems through side-projects. He also plays the piano and is a newbie beatboxer.